Finally an answer to a question that has gnawed at me for decades: Where did one of the great windmill manufacturers of all time get the name Aermotor? Why not Aeromotor? That was the way I’ve spelled it—in error--many times. Why not Airmotor? That’s certainly what it was. It wasn’t until Still Turning: A History of Aermotor Windmills by Christopher Gillis that I found the answer. Blame it on the Germans, or at least Germanic speakers. The most advanced windmill of its day was introduced by Chicago industrialist La Verne Noyes and his chief engineer Thomas Perry as Aërmotor. Yes, with the umlaut customers were expected to pronounce the name as Air-Motor. The company soon dropped the umlaut but left the “e” in place. The rest, as they say, is history. Aermotor--sans umlaut--became the embodiment of the American water-pumping windmill. To those outside the US sensitive to American braggadocio, the company and its widely copied design became known as the Chicago mill because the windy city’s name was also emblazoned on the tail vane. This is the kind of arcane detail found in Still Turning that any windmill geek will find entertaining. Still Turning is clearly a labor of love. There’s something about those who’ve been trapped by a fascination for wind engines both modern and historical. It’s a disease, some might say. I have it. Small wind guru Mick Sagrillo has it and it’s apparent that Chris Gillis is infected with it too. Why do we write books? Why do we write books about such obscure subjects as windmills? It’s not for the money that’s certain. It’s not for fame—or prestige. It has to be for the fascination of exploring a time, a people, and the machines they created in response to working with what nature put at hand. These wanderings down the rabbit hole of technology and culture offer up, we hope, a window on our own time. Still Turning dives with gusto into topics on the early history of windmills that have equally intrigued me in my research. Gillis has one of the best illustrations I’ve seen anywhere of the Persian mills in what is today Iran. But he finds his stride in exploring the traditional European or “Dutch” windmill with which we are all familiar. For example, he explains how the Dutch ganged windmills together in strings to drain their famous polders. Landing today at Schipol, literally the hole where Dutch ships disappeared into an inland sea, one could be excused for not being aware that the airport exists today only because of the hundreds of windmills that drained the land on which it sits. It’s only from such dedicated research that we find such gems. Or we find some comfort in knowing that modern opposition to wind energy has historical precedent. When Britain imported Dutch settlers—and their technology—to drain the Fens of Cambridgeshire, the locals rebelled. Those who lived by trapping and fishing opposed the land reclamation the windmills enabled by attacking the windmills that were draining the Fens. Don Quixote was not alone. Today, Ordnance Survey maps still show dozens of historical windmills around the ecclesiastical town of Ely, the great ship of the Fens. Who hasn’t gazed upon the American farm windmill and thought, “That’s a really ugly windmill.” That treasonous opinion is quickly subsumed by our association of the farm windmill with what has become an iconic—even bucolic—symbol of America’s past. Yet Gillis’ research uncovers the gem that in its day one architect condemned the by then ubiquitous farm windmill as an offensive sight, an “awkward, spider-like structure dancing fandangos before our eyes” marring the “landscape of our otherwise beautiful homes.” The quote could have been lifted directly out of some modern anti-wind energy web site attacking the rise of wind turbines on the landscape. Gillis brings all his research home to us Yankees by describing how extensively windmills were used in New England from the salt works on Cape Cod to the windmill used by the Russian settlement at Fort Ross in what was to become California. There Gillis turns inward, taking us to the heartland of the continent and its great prairies where water was more difficult to come by and where a new kind of windmill was needed. The bulk of his book is a corporate history of the Aermotor company. But the tale takes enough twists and turns that it will keep the serious wind aficionado fascinated if not entertained. He dutifully includes the photo of the ever impressive 1893 Columbian Exposition with its dozen of farm windmills. One noteworthy installation was a reconstruction of a Dutch windmill upon which Aermotor installed an 87-foot tower and its namesake turbine. It was the city’s chest-thumping promotion of this event that led journalists to call Chicago the “windy city” as in a long-winded, fast-talking salesmen not as is popularly believed because the city is in fact windy. It is not. Aermotor rose to dominate the Chicago-based industry in part because it thoroughly tested its design before launch. This is a lesson that has been learned, lost, and rediscovered countless times in the history of wind energy. It’s a lesson still true today. What Aermotor did was unprecedented in its day. They created a laboratory where they could test the rotor’s aerodynamic performance. It was pioneering work that followed in the footsteps of English physicist John Smeaton more than a century earlier. Early on Aermotor developed their own tower design for their windmills and this grew into its own side business. Towers, and Aermotor’s work with wind pumping, led them to an ill-fated partnership with McDonnell Aircraft during the heyday of the US Department of Energy’s R&D program. Based on wind tunnel testing, McDonnell Aircraft bragged at the time that their giromill was the most efficient wind turbine ever built. Aermotor believed they had hitched their tower fortunes to a rising star in the wind business. Unfortunately, the project--like so many too good to be true stories--was a flop and Aermotor’s contribution to modern wind energy ceased. The latter part of the book of necessity chronicles Aermotor’s waning fortunes and its near disappearance from America’s corporate landscape. After many moves and several change of hands Aermotor still exists, or as in Gillis’ title is still turning. They produce about 2,000 units per year, or half of the total number of farm windmills sold in the United States each year. Aermotor is a survivor. It became the last American windmill manufacture standing after Dempster was run into the ground a few years ago by a fast-talking hustler with big—and unrealistic--plans. The American farm windmill is an integral part of our heritage, and Aermotor is its most visible manifestation. There remain tens of thousands, no one knows for sure how many, farm windmills across the North American continent. (Gillis says there are more than a 1,000 farm windmills operating on the Navajo Nation alone.) Many are still doing the job they were designed for more than a century ago. They are going to be with us for a long time to come, many still turning. 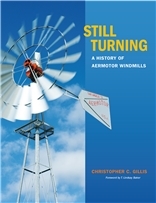 Still Turning: A History of Aermotor Windmills by Christopher Gillis. Foreword by T. Lindsay Baker. College Station, TX: Texas A&M University Press, 2015. 295 pages. . ISBN-13: 978-1-62349-335-6, ISBN-10: 1623493358. 11.2 x 8.8 inches. $35.00 cloth. Printed in the United States.